OK, so for reasons that remain somewhat unclear the blog went absolutely bonkers last week. First I couldn't post at all, and then by the time I could post I really didn't want to post and then a post from several months ago was sent out to all the subscribers which I guess was fairly confusing. You would think that being married to a fellow who graduated from the Massachusetts Institute of Technology might be useful at such times. But you would be incorrect. "Uh, honey, there's something wrong with the blog, will you figure it out?" ...his response is other than enthusiastic. 1. Hit side of computer repeatedly while mumbling unspecified invectives. 2. Throw hands skyward before declaring in a loud voice, "The internet is broken!" 3. Pour generous serving of alcohol. Consume. 4. Repeat Step Three until computer-related issues seem less pressing. Folks, if I do say so myself, the system is foolproof. I am happy to report that all that technical ugliness is now behind me (thanks, AT&T customer service!) which means that I can finally concentrate on the task at hand: detailing the particular horror that is - OPERATION SPARE BEAR. When last we left Snoodie's beloved BFF he was looking like patient zero in the impending bio-pocalypse. His nose, the preferred target of Snoodie's love gnaws, is barely hanging on and smells like something one might find in an aquarium's morgue. His belly has been used repeatedly to erase the playroom's blackboard, and the stuffing in his limbs has migrated to unsightly places as a result of persistent oversqueezing. Several months ago, I chronicled our attempts to introduce duplicate bears into the rotation in the hopes of slowing this wear-and-tear with exactly zero success. CHOICE #1: Allowing Blue Bear to meet an untimely end, we sit back and watch as his limbs and facial components fall off one by one until eventually Blue Bear is no more and Snoodie's personal devastation is complete. CHOICE #2: Do literally ANYTHING to avoid resorting to Choice Number One. 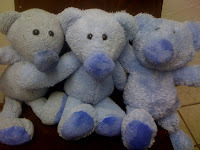 All this to say, folks, that we have decided harvest our two spare Blue Bears for parts. Yes, you heard me right, we're flying in the face of all that is human and decent and using clone bears. 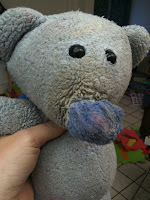 When Blue Bear #1's nose finally comes off, I'm going to pull the nose off Blue Bear #2's face and sew it onto the face of Blue Bear #1. The American Medical Association may have put a moratorium on the use of clones, but they'll NEVER STOP ME!! 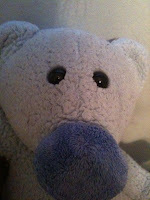 And, I just want to say in my own defense that there is room in my horrible heart to take some pity on Bears Nos. Two and Three. Surely they were created in the hopes that some adorable moppet would love them best of all one day. I've seen "Toy Story" and its sequels, and yes, I understand that Two and Three deserve better than to be hacked apart piece by piece, grafted onto a decidedly slimier version of themselves, and then chewed to a pulp by the marauding Snood monster. But these are desperate times, people. And desperate measures must be taken. All that remains to be seen is whether I can look into these soulful black eyes, wield the scissors and do what needs to be done.